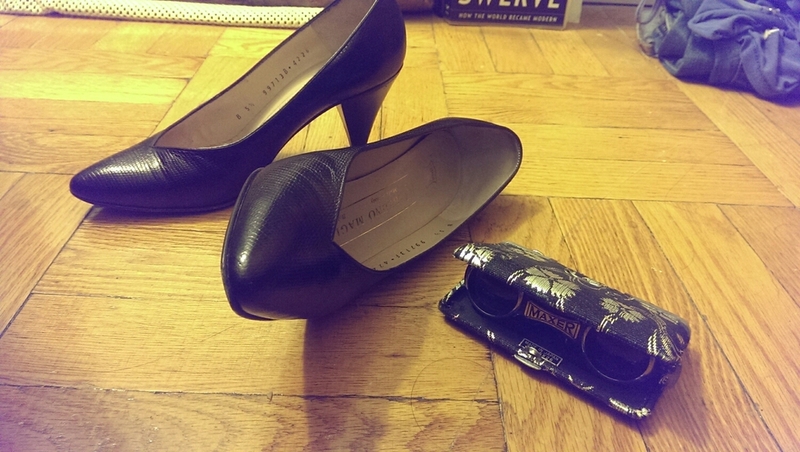 My sinful purchases in Philadelphia, Vintage italian pumps and Vintage Japanese opera glasses from Nostalgia Vintage. I’ve always dreamed about opera glasses, and now I have a pair! Now I just need to figure out how to get myself to the opera! Whenever there is leftover rice and when you think you have nothing left in the fridge, the solution is fried rice! With the help of a tin of salmon, frozen peas, lemongrass and fishsauce, inferno it all together and top it off with a pile of happy scrambled eggs! Success. Why go out when you can make a fabulous brunch for my greedy tummy? Sauteed an ripe persimmon fruit with turkey bacon, eggs and a side of spinach to keep the nutrient balance. Random day visit to the New York Historical Society with my friend D’. First to be presented with a parody/satire piece with a gentleman’s head on a woman’s body. I guess even from days before photography and graphic design, they liked to mash images together to poke fun at people or ideas. As a modern consumer of imagery in this digital age, the parody still comes across quite clearly. 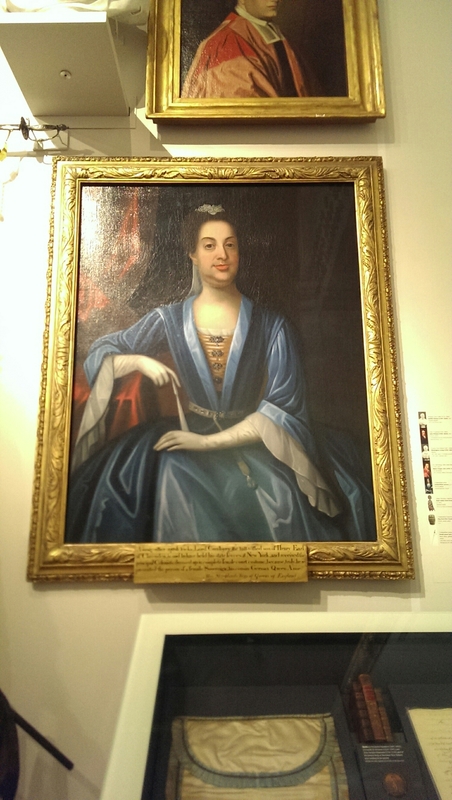 This is D', the culprit of my random excursion to the New York Historic Society. I have truncated his name... I don't know why, my version of a nickname? A Chinese Dragon Head, it could easily eat me as a snack! I just thought this poem was awesome. Boycotting a product due to political reasons is never an exciting time, but the point of view this was written in, is quite touching and humanistic. A fascinating part of the New York Historical Society, the mysterious door at the end of the corridor. 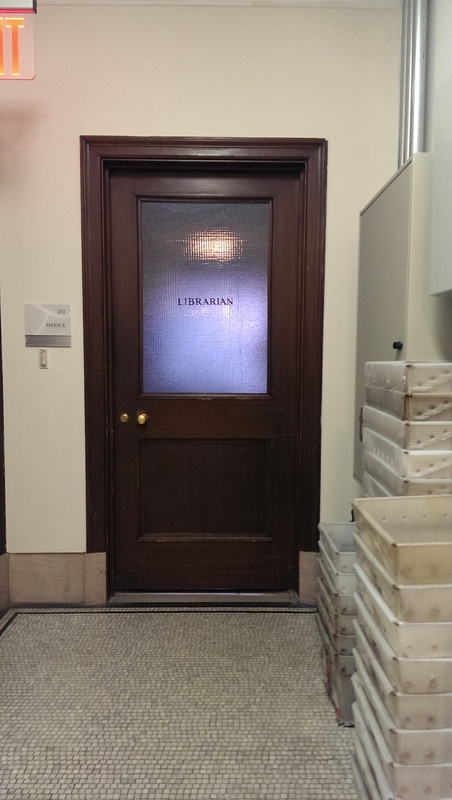 It claims ‘Librarian’ but with the feel of the dead end you wonder if there are magical or sinister things hiding behind that door. 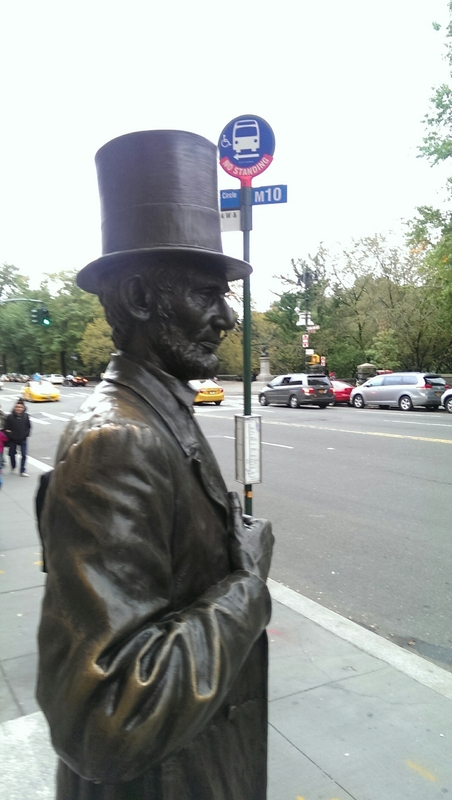 I feel that Abe Lincoln would have waited patiently at the bus stop if it was available instead of walking many many miles to school. He puts some classy and style into how one should poise at a public bus stop. If the New York Historical Society wasn’t enough, then a beer to be had at a real cultural historical site, a bar that claims establishment for at least over a hundred years, I can’t imagining what it must have been like before the days of TV’s and phones, people used to be able to hang out with their drinks without excessive surrounding noise…. 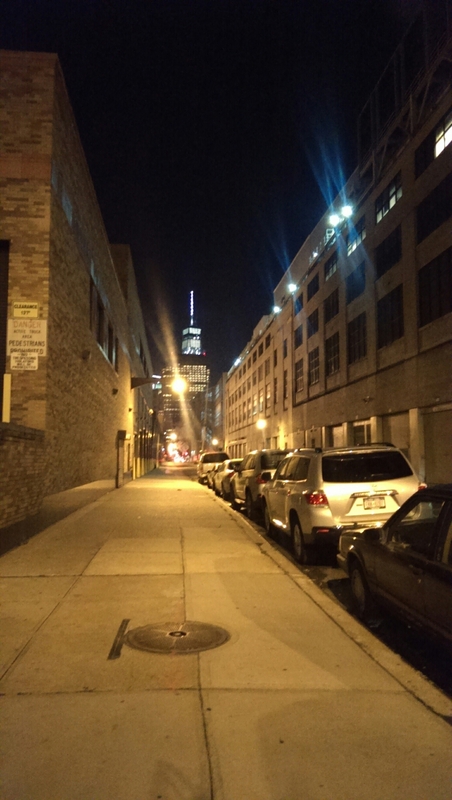 One would imagine that being in Manhattan will always be filled with people, but in this corner of lower Manhattan, it is not surprising to find a deserted street. Speaking of lights, while visiting the firehouse down by the World Trade Center, I got to see a truck called into action, and dashed away into the night. 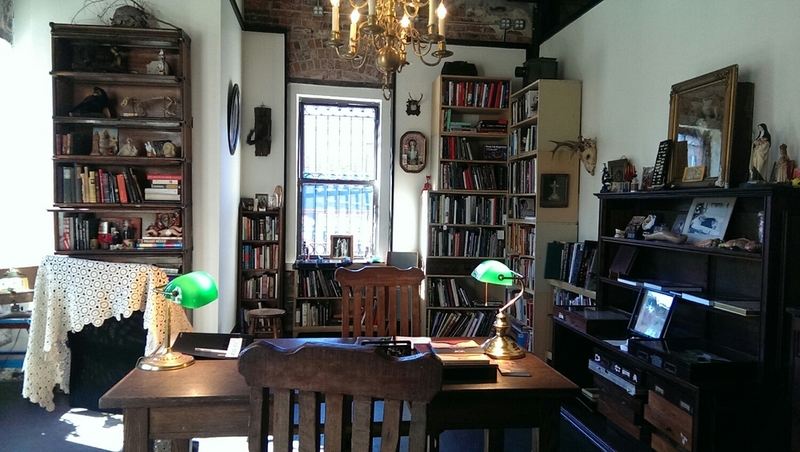 I got to counterbalance the active city scenery with some serene time in the Morbid Anatomy Museum Library. I enjoy their lectures they offer, and after a call for volunteers to Docent their gallery, I offered my services in exchange for a free coffee! 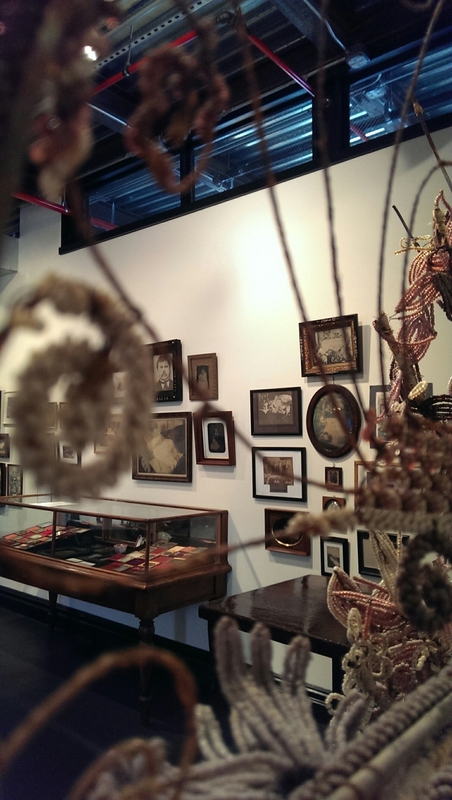 Technically no photos in the Morbid Anatomy Museum Gallery, but I couldn't resist this sneak shot through the view of the beaded funerary wreath looking into the funerary photographs on display. After a weekend full of History and Funerary artifacts, coming back to life with a engaging meal was paramount. 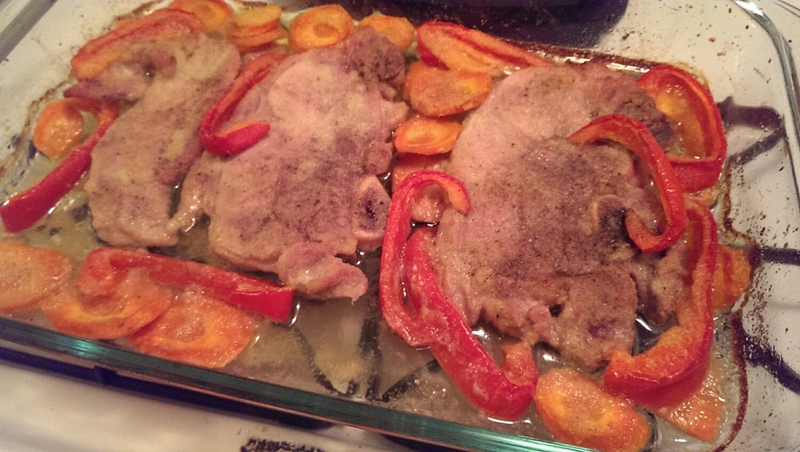 Pork chops with red peppers and carrots roasted in the oven served over egg noodles. Now that is reinvigorating! I was invited to a Benefit Auction, or in my opinion a "Tuesday Night Party". It turned out the one who invited me could not make it, so it was up to me to give a full report! 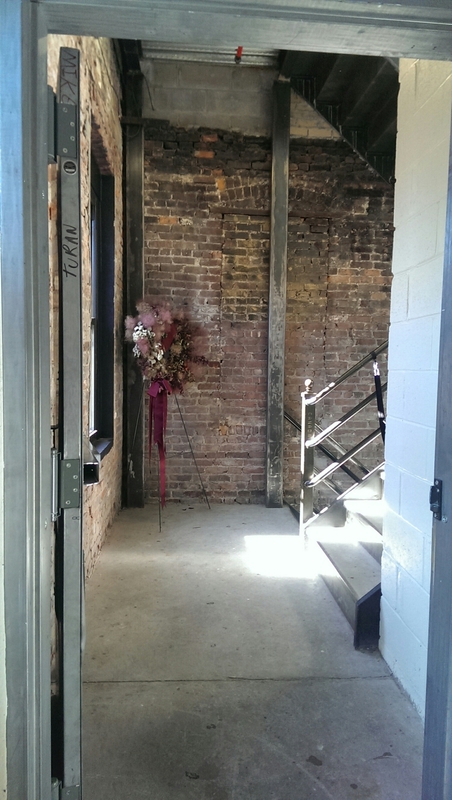 Gee, swanky stuff this Neuehouse joint. I'm told its a ritzy clubhouse usually. I didn't rub shoulders too much w the super rich, though this place was packed with people!! Many guests were seriously contemplating buying artworks that did not interest me. I think its a collectors mindset.. . I was actually a bit disappointed by the Shepard Fairey piece. I was planning to be blown away like the building sized mural I saw in Philly, but this was like a 20x16 inch piece. They had lots of fancy cheese tables w pairings of fig jams, balsamic honey and servers walked around w their version of Thomas Keller's famous ceviche in a finger sized cone, or a squash and cheese fried ball hors d'oeuvres. I ended up hanging out on the top center seat in the raised seating when nobody was there, and one of the girls w an groundswell artists badge saw me and said 'that's an awesome spot! I wanna be just like you' so i invited her up. She was reviewing her lines for a gift presentation, and showed me her lines card, it was so wordy 'what would you tell aspiring NY artists about using art as a tool for social change?' I gave her an alternatives that I could think of. Later I found out she was Crystl who did the artwork for a mural on a Bazzar Supermaket location and was awarding Faith Ringgold for her work. I got to see you for a second on the projection screen in their presentation video! One of these days you got to show me these Brownsville murals in person. now that is something done on an epic scale. The Center for Court innovation guy who was also received an award had some good comments to say about Brownsville, I wish I had recorded or written his words, they were pretty good. They had this super high energy lady from Christie's auction house doing the bidding for the live artwork that the muralist painters did on site. I've never seen a live contemporary auctioneer, and she gave good energy, high speed and on top of the number for the current bid. I was like, I could do that too! I ended up w better banter w the staffers than the patrons, I can't seem to handle pretentious well, hence me hanging out with a birds eye view of the event. And I am not a seasoned 'one handed wine glass and plate holder' like many of the other attendee's. I was sad my 10 dollar raffle ticket didn't get selected for a mural walk, dinner and gin tasting for 6 people. I left with two brownies they were handing out at the door. It shall be my snack for tomorrow!" This salad was intense, spinach, curried chicken, walnuts, mushrooms, goat cheese, roasted zucchini eggplant mix. Consumed with carefully selected beers of course! As it gets colder, the need for soups increase. Curried ground beef with Korean rice cakes all in broth. Oh, and the best part about this one is that I boiled the Korean rice cakes with ginger!! I never saw such a sad looking school bus. After careful observation I believe it is somebody's personal residence, but it still didn't explain the mysterious condition of the paint job. Happy Juice! no, its a smooth easy to drink raw juice made by Botica & Co, with this being a particular blend of ingredients meant as a female tonic. Nani on the left invited Sophie and I to try out this recently opened Juice /Apothecary bar. They had the energetic green juice of cucumbers and other vegetably-ness. I am generally not a fan of the really bitter green juices, but their version was light, refreshing and didn't have to chew through to enjoy. 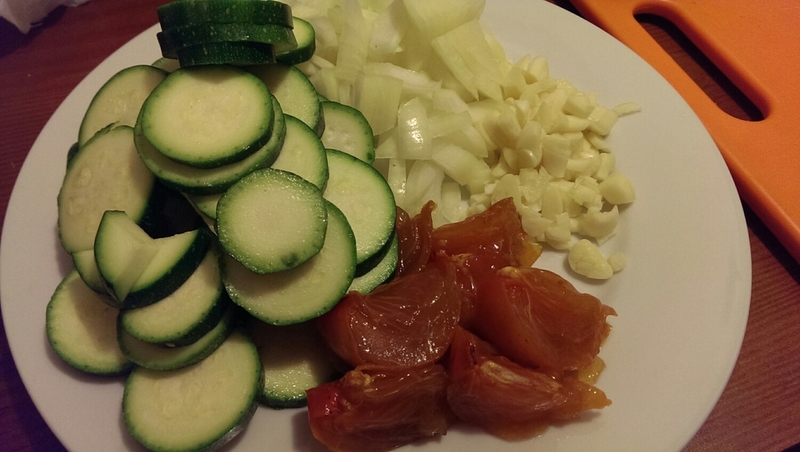 Inspired to be healthier, zucchini, ripe persimmon, garlic, onion show up in the menu. I was craving fish, so trout made it in and out of the oven to pair with the zucchini! I love leftovers! It heightens the anticipation for my lunch the next day!! 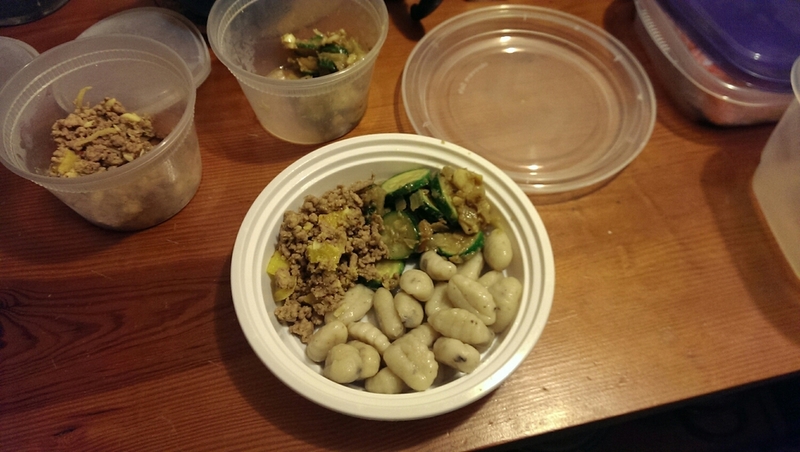 Mushroom gnocchi, zucchini persimmon saute and curried beef. Wanderings through Gowanus took me to a fascinating bridge, this one was meant to move diagonally sideways to open a gap through the canal! To add to the industrial-sketchy stereotype vibe of Gowanus, a rare sight of a fire hydrant on the ground... I can't imagine how it became to be like that. I find myself volunteering again at the Morbid Anatomy Museum, only to find an incarnate of my future self if I am lucky enough to reach the age of this grandmother in all green!!! "Any Trial, Whatever that comes to you, can be conquered by silence" Abbot Pastur. The modest sign in front of a Aikido Dojo in Gowanus. It is a very contemplative quote, and I have to agree, if I can be silent enough, I can hear that tiny voice in my head that leads my gut feeling. If I can be mute and simply breathe, the silence will bring me to peace. I enjoy handwriting, I think its slightly sad that handwriting does not have the power that it used to , now that typing and thumb messaging is the primary way to generate words. I get he most out of handwriting because I find myself thinking intentionally on paper, and it forces me to clarify my language and the command travels from my brain to the hand. I do not have the answer for this shape yet, I can only acknowledge its presence as it shows up more frequently when I am compelled to run my pen freely. Fennel, potatoes, lamb bones, carrots, jalapeno, garlic... the beginning of magic! Salt the lamb bones with Adobo and chop the jalapeno to pair with it. Another adventure with Noble Ms. Brown! Browning lamb bones in butter with jalapeno and garlic. lemongrass and ginger join the mix. seasoned with turmeric, chili, cumin and curry brought to a boil and thrown into the oven with the lid! The lamb is falling off the bone, potatoes and carrots soft but not gooey, and fennel is juicy and sweet! And since I got too hungry before the Lamb Bone braise was done in the oven, I treated my grumbling tummy a sauteed spinach sandwich with cranberries! Whoo!